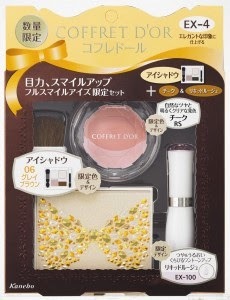 Coffret D'Or will release four limited edition Total Designing Sets (3800yen with a retail value of 6200yen) on 16 September in Japan. Each set contains a Full Smile Eyeshadow palette, liquid rouge EX100 and blush. The liquid rouge shade is the same in all four sets. Set EX1 contains Full Smile Eyeshadow 01 (apricot beige), EX2 contains Eyeshadow 05 (pink beige), EX3 contains Eyeshadow 03 (bronze black) and EX04 contains Eyeshadow 06 (grey brown). Sets EX1 and EX2 contain the same pink blush while EX3 and EX4 feature the same rose blush. Nice! I love it when they do these sets. They're a nice way to sample new items!